Imagine that you have come around the world to found a proverbial city upon a hill – a model of Christian living which you intend as an example for the world. What happens when the experiment spins out of control? Plimouth Plantation is a living history park in Massachusetts that strives to recreate 17th century life in Plymouth faithfully for visitors. In 1607 a small group of Separatists—a radical sect of Puritans who did not believe the Established Church could ever be reformed—departed for Leyden, Holland, where the Dutch granted them asylum. However, the Calvinist Dutch restricted them mainly to low-paid laboring jobs. Some members of the congregation grew dissatisfied with this discrimination and resolved to emigrate to the New World. In 1620, a group of Leyden Puritans secured a land patent from the Virginia Company. Numbering 101, they set out for Virginia on the Mayflower. A storm sent them far north and they landed in New England on Cape Cod. Believing themselves outside the jurisdiction of any organized government, the men drafted a formal agreement to abide by “just and equal laws” drafted by leaders of their own choosing. This was the Mayflower Compact. The Mayflower was originally bound for the Colony of Virginia, financed by the Company of Merchant Adventurers of London. Storms forced them to anchor at the hook of Cape Cod in Massachusetts, as it was unwise to continue with provisions running short. This inspired some to proclaim that, since the settlement would not be made in the agreed-upon Virginia territory, they “would use their own liberty; for none had power to command them.” To prevent this, the Pilgrims chose to establish a government described in the Mayflower Compact. It was in essence a social contract in which the settlers consented to follow the compact’s rules and regulations for the sake of order and survival. In December the Mayflower reached Plymouth harbor; the Pilgrims began to build their settlement during the winter. Nearly half the colonists died of exposure and disease, but come spring, neighboring Wampanoag Indians provided the information that would sustain them: how to grow maize. The Landing of the Pilgrims, by Henry A. Bacon, 1877. 1911 illustration of Tisquantum (“Squanto”) teaching the Plymouth colonists to plant maize. Some European expedition captains were known to increase profits by capturing natives to sell as slaves. Such was the case when Thomas Hunt kidnapped several Wampanoag in 1614 in order to sell them later in Spain. One of Hunt’s captives was a Patuxet named Tisquantum. Tisquantum eventually came to be known as Squanto (a nickname given to him by his friend William Bradford). After Squanto regained his freedom, he was able to work his way to England where he lived for several years, working with a shipbuilder. He signed on as an interpreter for a British expedition to Newfoundland. From there Squanto went back to his home, only to discover that, in his absence, epidemics had killed everyone in his village. Squanto was the last of the Patuxet. When the Mayflower landed in 1620, Squanto worked to broker peaceable relations between the Pilgrims and the local Pokanokets (another group in Wampanoag). He played a key role in the early meetings in March 1621, partly because he spoke English. He then lived with the Pilgrims for 20 months, acting as a translator, guide, and adviser. He introduced the settlers to the fur trade, and taught them how to sow and fertilize native crops, which proved vital since the seeds which the Pilgrims had brought from England largely failed. Whatever his motivations, with great kindness and patience, Squanto taught the English the skills they needed to survive, including how best to cultivate varieties of the Three Sisters: beans, maize and squash. BONUS: Read more about The Three Sisters. Illustration of corn cultivation in mounds by Algonquian village in North Carolina. Watercolor by John White c. 1585. In the fall of 1621, the Plymouth colonists and Wampanoag shared an autumn harvest feast. This feast was a celebration of the first successful harvest season of the colonists. This three-day celebration involving the entire village and about 90 Wampanoag has been celebrated as a symbol of cooperation and interaction between English colonists and Native Americans. The event later inspired 19th century Americans to establish Thanksgiving as a national holiday in the United States. The harvest celebration took place at the historic site of the Patuxet villages. Squanto’s involvement as an intermediary in negotiating the friendship treaty with Massasoit led to the joint feast between the Pilgrims and Wampanoag. Considerable mythology and legend has grown up around Squanto over time, largely because of early praise by Bradford and owing to the central role that the Thanksgiving festival of 1621 plays in American folk history. Squanto was less the “noble savage” that later myth portrayed him and more a practical adviser and diplomat. John Winthrop was one of the leading figures in founding the Massachusetts Bay Colony, the second major settlement in New England, following Plymouth Colony. Winthrop led the first large wave of immigrants from England in 1630 and served as governor for 12 of the colony’s first 20 years. His writings and vision of the colony as a Puritan “city upon a hill” dominated New England colonial development, influencing the governments and religions of neighboring colonies. A new wave of immigrants arrived on the shores of Massachusetts Bay in 1630 bearing a grant from King Charles I to establish a colony. Many of them were Puritans whose religious practices were increasingly prohibited in England. Their leader, John Winthrop, urged them to create a “city upon a hill” in the New World—a place where they would live in strict accordance with their religious beliefs and set an example for all of Christendom—an example of communal charity, affection, and unity to the world or, if the Puritans failed to uphold their covenant of God, “we shall be made a story and a by-word through the world” of God’s judgment. Winthrop’s sermon is often cited as an early example of American exceptionalism. The Massachusetts Bay Colony was to play a significant role in the development of the entire New England region, in part because Winthrop and his Puritan colleagues were able to bring their charter with them. Thus the authority for the colony’s government resided in Massachusetts, not in England. Under the charter’s provisions, power rested with the General Court, which was made up of “freemen,” required to be members of the Puritan, or Congregational, Church. This guaranteed that the Puritans would be the dominant political as well as religious force in the colony. The General Court elected the governor, who for most of the next generation would be John Winthrop. The Puritan emphasis on reading directly from the Scriptures underscored the importance of literacy. In 1647 the Massachusetts Bay Colony enacted the “ye olde deluder Satan” Act, requiring every town having more than 50 families to establish a grammar school (a Latin school to prepare students for college). Shortly thereafter, all the other New England colonies, except for Rhode Island, followed its example. The Pilgrims and Puritans had brought their own little libraries and continued to import books from London. And as early as the 1680s, Boston booksellers were doing a thriving business in works of classical literature, history, politics, philosophy, science, theology, and belles-lettres. In 1638 the first printing press in the English colonies and the second in North America was installed at Harvard College. Like most Christians in the early modern period, Puritans believed in the active existence of the devil and demons as evil forces that could possess and cause harm to men and women. There was also widespread belief in witchcraft and witches—persons in league with the devil. “Unexplained phenomena such as the death of livestock, human disease, and hideous fits suffered by young and old” might all be blamed on the agency of the devil or a witch. In 1692 a group of adolescent girls in Salem Village, Massachusetts, became subject to strange fits after hearing tales told by a West Indian slave. They accused several women of being witches. The townspeople were appalled but not surprised: Belief in witchcraft was widespread throughout 17th-century America and Europe. Town officials convened a court to hear the charges of witchcraft. Within a month, six women were convicted and hanged. The hysteria grew, in large measure because the court permitted witnesses to testify that they had seen the accused as spirits or in visions. Such “spectral evidence” could neither be verified nor made subject to objective examination. By the fall of 1692, 20 victims, including several men, had been executed, and more than 100 others were in jail (where another five victims died)—among them some of the town’s most prominent citizens. When the charges threatened to spread beyond Salem, ministers throughout the colony called for an end to the trials. The governor of the colony agreed. Those still in jail were later acquitted or given reprieves. Giles Corey (Sept. 19, 1692) being pressed with heavy stones for failing to enter a plea to the charge of being a witch during the Salem Witch Trials. Although an isolated incident, the Salem episode has long fascinated Americans. Most historians agree that Salem Village in 1692 experienced a kind of public hysteria, fueled by a genuine belief in the existence of witchcraft. While some of the girls may have been acting, many responsible adults became caught up in the frenzy as well. Even more revealing is a closer analysis of the identities of the accused and the accusers. Salem Village, as much of colonial New England, was undergoing an economic and political transition from a largely agrarian, Puritan-dominated community to a more commercial, secular society. Many of the accusers were representatives of a traditional way of life tied to farming and the church, whereas a number of the accused witches were members of a rising commercial class of small shopkeepers and tradesmen. Salem’s obscure struggle for social and political power between older traditional groups and a newer commercial class was one repeated in communities throughout American history. It took a bizarre and deadly detour when its citizens were swept up by the conviction that the devil was loose in their homes. Accused witch Bridget Bishop hanged at Salem. The rigid structure of the Puritan rule was not to everyone’s liking. One of the first to challenge the General Court openly was a young clergyman named Roger Williams, who objected to the colony’s seizure of Indian lands and advocated separation of church and state. Another dissenter, Anne Hutchinson, challenged key doctrines of Puritan theology. Both they and their followers were banished. Narragansett Indians receiving Roger Williams. So‑called heretics like Williams were not the only ones who left Massachusetts. Orthodox Puritans, seeking better lands and opportunities, soon began leaving Massachusetts Bay Colony. News of the fertility of the Connecticut River Valley, for instance, attracted the interest of farmers having a difficult time with poor land. By the early 1630s, many were ready to brave the danger of Indian attack to obtain level ground and deep, rich soil. These new communities often eliminated church membership as a prerequisite for voting, thereby extending the franchise to ever larger numbers of men. Massasoit, chief of the Wampanoag, and early Plymouth governor John Carver smoking a peace pipe. The Pilgrims who arrived on the Mayflower and founded Plymouth Plantation expended great effort forging friendship and peace with the American Indians around Cape Cod. They traveled long distances to make peace with Massasoit, chief of the Wampanoag tribe, and Governor William Bradford made a gift of his prized red horse coat upon seeing that the chief admired it. Yet over the next 50 years, frictions and misunderstandings multiplied as wave after wave of Puritans and non-religious “strangers” (fortune-seekers not motivated by religion) kept arriving, often oblivious to the fragile peace carefully woven since the earliest arrivals. By 1675, the early efforts at friendship failed. The Wampanoag tribe had entered into an agreement with the Plymouth Colony and believed that they could rely on the colony for protection. However, in the decades preceding the war, it became clear to them that the treaty was not stopping colonists from settling in Wampanoag territories. Throughout the Northeast, Native Americans had suffered severe population losses as a result of pandemics of smallpox, spotted fever, typhoid, and measles, starting in about 1618, two years before the first colony at Plymouth had been settled. The population of New England colonists totaled about 80,000 people. They lived in 110 towns, of which 64 were in the Massachusetts Bay colony, which then included the southwestern portion of the present state of Maine. The towns had about 16,000 men of military age who were almost all part of the militia, as universal training was prevalent in all colonial New England towns. Many towns had built strong garrison houses for defense, and others had stockades enclosing most of the houses. All of these were strengthened as the war progressed. Some poorly populated towns without enough men to defend them were abandoned. Each town had local militias, based on all eligible men, who had to supply their own arms. Only those who were too old, too young, disabled, or clergy were excused from military service. The militias were usually only minimally trained and initially did relatively poorly against the warring Indians, until more effective training and tactics could be devised. Joint forces of militia volunteers and volunteer Indian allies were found to be the most effective. The officers were usually elected by popular vote of the militia members. Map depicting the approximate tribal territories of Native Americans around the year 1600, before the foundation of any permanent English settlements. By 1676, the regional Indian population had decreased to about 10,000 (exact numbers are unavailable), largely because of epidemics. These included about 4,000 Narragansetts of western Rhode Island and eastern Connecticut, 2,400 Nipmucks of central and western Massachusetts, and 2,400 combined in the Massachusett and Pawtucket tribes living around Massachusetts Bay and extending northwest to Maine. The Wampanoags and Pokanokets of Plymouth and eastern Rhode Island are thought to have numbered fewer than 1,000. About one in four were considered to be warriors. By then, the Indians had almost universally adopted steel knives, tomahawks, and flintlock muskets as their weapons of choice. The various tribes had no common government. They had distinct cultures and often warred among themselves, although they all spoke related languages from the Algonquian family. Indians Attacking a Garrison House, from an Old Wood Engraving This is likely a depiction of the attack on the Haynes Garrison, Sudbury, April 21, 1676. Notice the European livestock dead in the foreground – to the Wompanoag, a frequent source of ire and a potent symbol of encroaching colonists, as cattle would graze in native fields, destroying their harvest. Metacomet was the son of the sachem Massasoit, the Wampanoag chief who had originally made peace with the people of Plymouth colony in the 1620s. Because of his closeness with the colonists during his youth, he adopted the name King Philip. Unfortunately, by the time he himself became chief of the Wampanoag in 1662, the period of peaceful coexistence had become a distant memory following conflicts over land use, diminished game as a consequence of expanding European settlement, and questions of whether or not the Native Americans would submit to English rule. 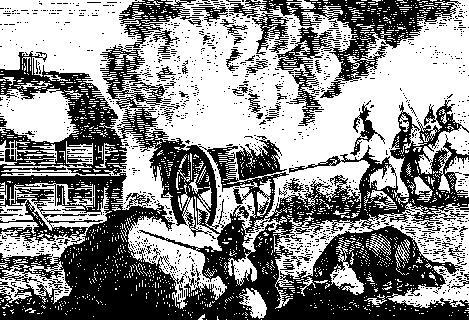 Starting in 1675, in a conflict known by the colonists as King Philip’s War, Metacomet used tribal alliances to coordinate efforts to push European colonists out of New England. The war was the single greatest calamity to occur in seventeenth-century Puritan New England and is considered by many to be the deadliest war in the history of European settlement in North America in proportion to the population. In the space of little more than a year, twelve of the region’s towns were destroyed and many more were damaged, the economy of Plymouth and Rhode Island Colonies was all but ruined and their population was decimated, losing one-tenth of all men available for military service. More than half of New England’s towns were attacked by Indians. “Philip. King of Mount Hope,” a 1772 engraving of a caricature of King Philip by Paul Revere. The war largely ended with Metacomet’s death. His head was mounted on a pike at the entrance to Plymouth, Massachusetts, where it remained for more than two decades. His body was cut into quarters and hung in trees. More than 1,000 colonists and 3,000 Indians had died. More than half of all New England villages were attacked by Indian warriors, and many were completely destroyed. Several Indians were enslaved and transported to Bermuda, including Metacomet’s son, and numerous Bermudians today claim ancestry from the Indian exiles.